This conversation between Srila Prabhupada and the poet Allen Ginsberg took place on May 13, 1969, in Columbus, Ohio. Srila Prabhupada: Lord Buddha is accepted as an incarnation of Krsna. This is stated in the Bhagavatam. He is accepted as the ninth incarnation. Baladeva is the eighth. And the tenth is awaiting. Allen Ginsberg: Now, what is Kalki's nature? Srila Prabhupada: That is described in the Bhagavatam. He will come just like a prince, with royal dress and sword, on horseback simply killing, no preaching. There will be no brain to understand God. Allen Ginsberg: There will be no brain to understand God? Allen Ginsberg: So Kalki comes at the end of the Kali-yuga? Srila Prabhupada: Yes. Then Satya-yuga will begin. Srila Prabhupada: Satya-yuga is the pious age. People will be pious, truthful, long-living. Allen Ginsberg: Are those the people that will remain, or are they from whatever new creation comes out of the destruction? Srila Prabhupada: All the miscreants will be killed. And there must be some pious. They remain. Allen Ginsberg: Will people still be chanting Hare Krsna in 400,000 years? Srila Prabhupada: No. Hare Krsna will be finished within ten thousand years. There will be no more Hare Krsna. Srila Prabhupada: Nothing. I'll kill you and eat you, and you shall kill me. You shall eat me. That will be left. Srila Prabhupada: Yes, there will be no grain, no milk, no sugar, no fruit. So I will have to eat you, and you will have to eat me. Full facility for meat-eating. [Laughter.] Full facility. Krsna is very kind. He'll give you facility: "All right. Why cows and calves? You take your own son. Yes. Eat nicely." Just like serpents, snakes they eat their own offspring. Also tigers. So this will happen. And there will be no brain to understand [God], no preachers, nothing. And then Krsna will come: "All right, let Me kill you so that you will be saved." Allen Ginsberg: But you see it as actually a historical thing of ten thousand years for the chanting? Srila Prabhupada: Now it will increase. Srila Prabhupada: Up to ten thousand years. Allen Ginsberg: So what is the purpose right now? Srila Prabhupada: [Laughs.]Yes. So the sooner we take shelter shelter of Krsna consciousness the better. Allen Ginsberg: When did this yuga begin? Srila Prabhupada: Kali-yuga began five thousand years ago. Allen Ginsberg: Where is all this information? 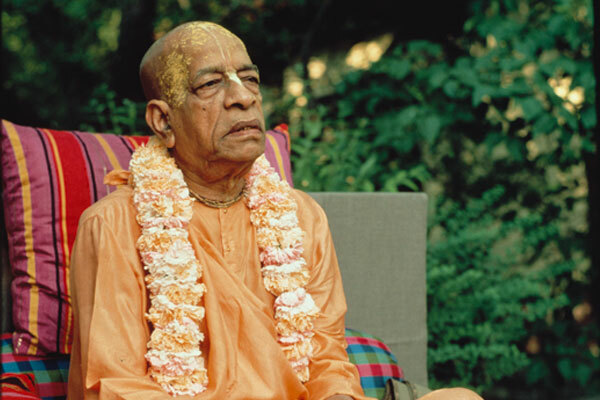 Srila Prabhupada: In the Vedic literature, the Bhagavatam. Allen Ginsberg: It has the detailed analysis of what goes on in the Kali-yuga? Srila Prabhupada: Oh, yes. I will read it to you sometime. In the Twelfth Canto, the Kali-yuga descriptions are there. And you will find that all the descriptions are coming true. Just like there is one statement, svikara eva udvahe: "Marriage will be performed simply by agreement." Now that is being done. And lavanyam kesa-dharanam: "People will think that they have become very beautiful by keeping long hair." That is coming true. Allen Ginsberg: In the Bhagavata Purana is there also provision for the Caitanya cult? Srila Prabhupada: Oh, yes. We have given that in our book Teachings of Lord Caitanya. Srila Prabhupada: They become liberated and go back home, back to Godhead. Allen Ginsberg: And everybody else gets involved deeper and deeper in the yuga. Srila Prabhupada: Yes, yes. So if anyone believes in the sastras [scriptures], he should take to this Krsna consciousness. That is intelligence to take advantage of the authorized scriptures.